I woke in the darkness to dress and prepare for my first trail marathon. My mother wisely stayed out of my way as I nervously raced from one room of her house to the other and tried to pull myself together while downing my standard pre-race breakfast of sprouted-grain bread, natural peanut butter, and a banana. I washed my vitamins down with a bottle of water and unplugged all of my electronics I would need for the day. By the time we arrived at the starting line, the sky was overcast and the grounds were crawling with a few hundred excited runners. I noticed that most of them were conspicuously missing fuel belts and water bottles. A few had some strange-looking cloth spats over their shoes. Only a handful lined up for the first wave of the full marathon – most were running the half or the quarter. This was going to be a different beast. I headed toward the back of the line in the first wave, reasoning that I usually finish a little faster than the middle of the pack. An informal national anthem sing-along, and then the gun. We were off. We ran through the grass and snaked around on the edge of some trees, and then we melted into the woods on a skinny trail. Oh boy. I mentally kept track of about how many runners were in front of me and exactly how many I passed. I was up by 3, and then someone went around me. Damn. The trail was tricky and required much more concentration and focus than I was used to giving to a run. Logs, tree roots, and flights of stairs… I was tired already. Mile marker – 1. Are you kidding me? My fuel belt was twisting and pulling and driving me crazy. 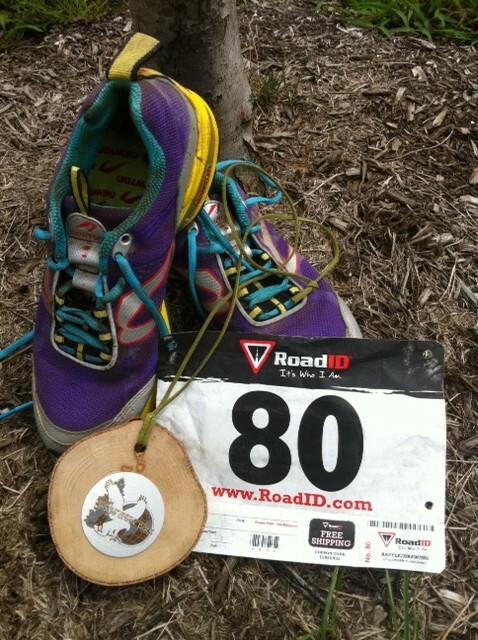 That’s why… The next 3 miles felt like 18, and I decided I didn’t like trail running so much. I struggled to keep pace with the people ahead and was quickly overtaken by an uncountable crowd of agile young men who were running the half. Ugh. The familiar gravel road around the lake in the hot sun ended up being the least of my troubles, but fun it wasn’t. Never again. Never. Back into the woods for more torture, and then a hot asphalt road in the sun for good measure. Then they began to pass me in both directions. I was irritated and jealous of the runners who were already on the return. They were dancing through the trails gracefully, like deer in bright-colored shorts and bib numbers. How could they do that? As I neared those first/last 4 hellish miles once again on the first loop, I heard the half-marathon people encouraging, “You’re almost there!” but I knew it wasn’t true for me. The finish line was a welcome sight only because I saw tables full of water bottles waiting. I wasn’t quite sure what to do then – just keep going for another 13.1? Or should I just stop? Surely my body would not cooperate with a second round. I already felt beat up. I saw a familiar shirt with tattooed shoulder blades reaching for a water bottle. I think he had shouted something encouraging to me along the way at some point. I told him I wanted to quit and wasn’t sure what to do. He said, “C’mon… I’ll get you through,” and I obediently began the second loop with Tattoo Guy, wondering how in the holy hell I was going to do this a second time. As we worked our way through the first four grueling miles, I learned that Tattoo Guy was an experienced ultra-runner with lots of tips and stories. He didn’t seem to have a race goal in mind and didn’t seem to be bothered that coaching me was probably keeping him from his usual pace. He stayed with me. He gave me a salt tablet when my fingers were so swollen they were unrecognizable. He encouraged me to eat and drink and rest at the aid stations. We walked up hills and ran down the other side. We pressed on. We caught up to a darling young woman who was running her first marathon at age 19. Little Miss became a part of our “just finish it” team, and together, we braved the next 10 – 11 miles or so, helping, encouraging, and getting to know one another. It was 90 degrees in the shade. The sun beat down on the parched Indiana earth, continuing the summer-long punishment from Mother Nature. With Team Just Finish It beside me, I knew I would make it, but I was hurting. Tattoo Guy had a stomach issue and sent Little Miss and me ahead. Reluctantly, we left him, looking back over our shoulders every few hundred yards to try to catch a glimpse of blue. I felt horribly guilty leaving my guardian angel, but I thought he might just want to have a little privacy. Little Miss battled leg cramps in those dreaded last 4, and I asked her if she minded if I ran ahead. She waved me on. I just wanted to get it over with. I reached the final aid station with one mile to go, and the volunteers were offering tempting refreshments, but I waved at them and kept moving. Get me out of here – now, I thought. As I came into the clearing with the finish flags in sight, I heard my name and an impressive crowd of cheers and whoops from my loved ones. Pushing… one foot in front of the other… brain dead and dog tired… grateful beyond measure… I crossed the finish line and thankfully received the unique wooden finisher’s medal around my neck. Despite my time and placement (6:31:16, 9thfemale in my age group, 81st overall), I might be more proud of this run than any other to date. Next time, I’m buying my shoes up a 1/2 size and ditching the fuel belt. Yeah, that’s right. I said next time. 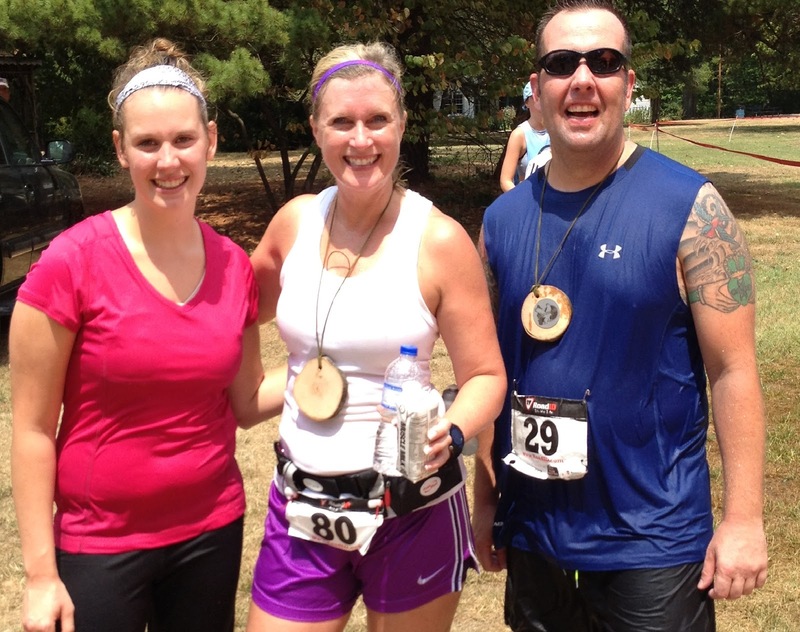 Congratulations on your trail marathon! Great race report. 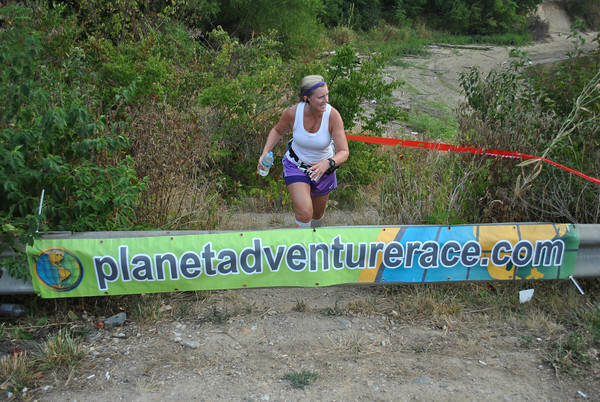 I've always been a little scared to do a trail marathon. I ran the 25k at Turkey Swamp once and it was incredibly hard. Kudos to you for going out for that second loop. Awesome job.